“Kids and Chemistry is a community outreach program led by Truman students through the American Chemical Society. Throughout the semester, a group of 4-8 Truman students travels to a local elementary school (grades 3-5), where they lead a 90 minute program about chemistry. The program begins with a safety presentation and a short demonstration, and then the class is split into smaller groups for activities. 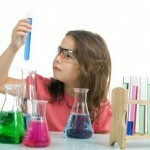 This small group setting allows the kids to perform their own experiments under close supervision. Truman students assemble all the materials required and put together an activity book for each child. This is a great opportunity for Truman students to take their passion for chemistry into the community and to inspire future chemists! These events are very fun, and we would love to have you join us! For more information, please come to ACS general meetings on Wednesday nights or email Leela Chapman at lac1683@truman.edu.